Above, we see the hotel known originally as the Union Depot Hotel, built in 1898 across from the very busy old Union Depot, at the intersection of two major rail lines: the Houston & Texas Central (the H&TC, which ran north-south) and the Texas & Pacific (the T&P, which ran east-west). 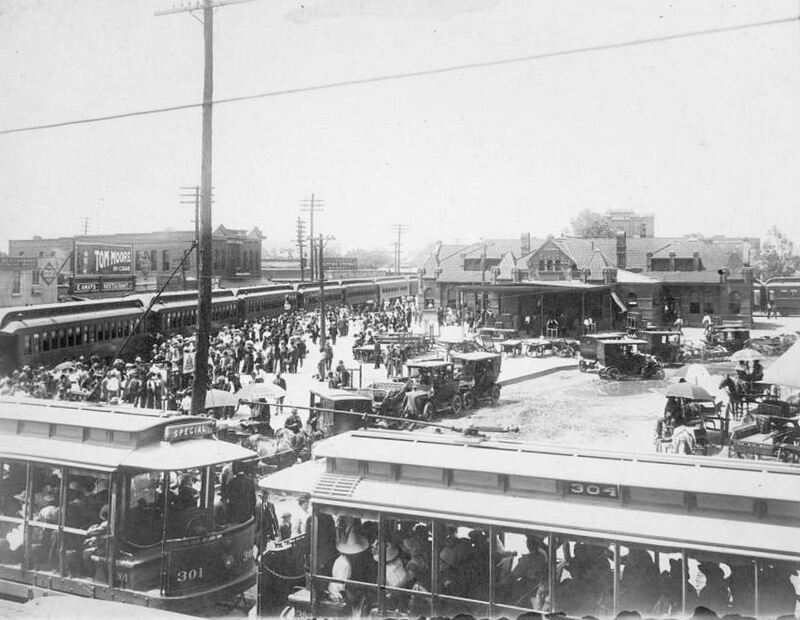 The tracks crossed at the intersection of Central and Pacific — streets named after the two railroads — in the area east of downtown we now call Deep Ellum. The hotel was on the southwest corner of that intersection. 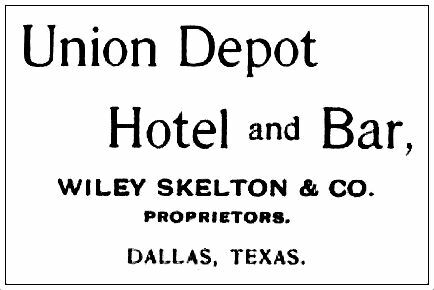 The large, two-story hotel (which also housed a popular cafe and bar) was built by William S. Skelton — more commonly known as Wiley Skelton — to cash in on the large number of travelers coming to Dallas via the bustling passenger depot right across the street. 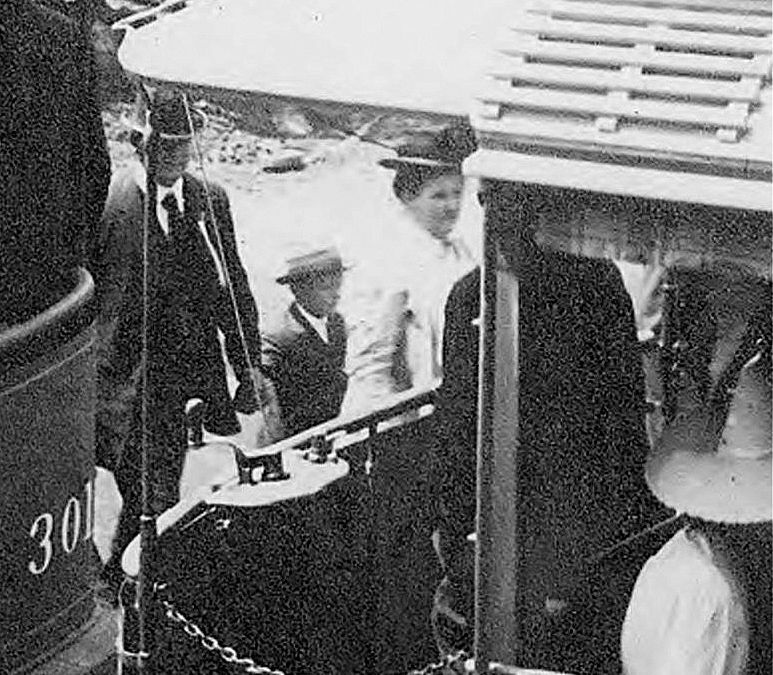 When it opened, it was charging a hefty two bucks a day (the equivalent of about $60.00 in today’s money) — a large-ish sum in 1899, but … location, location, location. This two-dollar-a-day rate to stay at Skelton’s hotel was the same as the base rate of Dallas’ ritziest, priciest hotels, The Windsor and The Oriental. How could Skelton’s “wrong side of the tracks” hotel charge similar rates as the city’s most elegant hotels? Convenience, convenience, convenience. 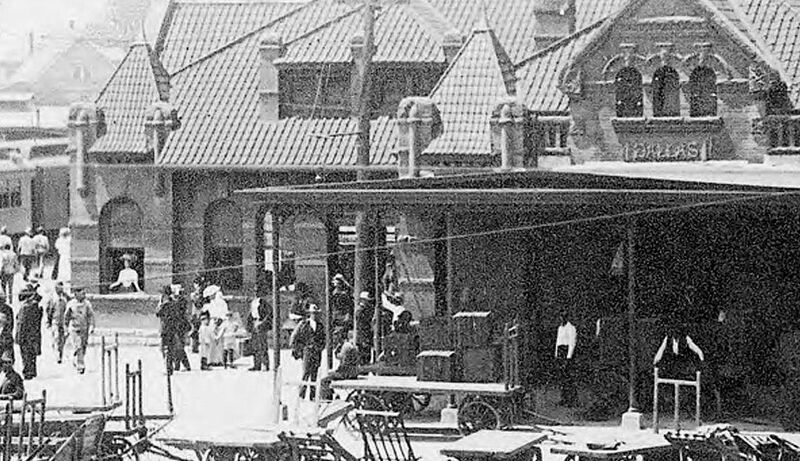 The Union Depot Hotel could not have been more convenient to weary travelers unless it had been located inside the depot. 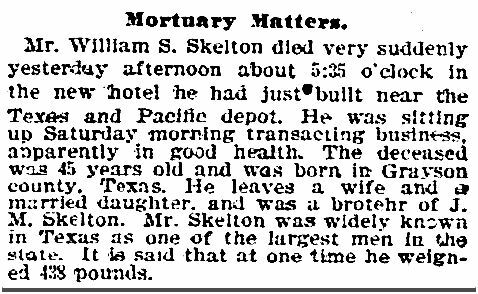 Skelton was a popular and successful businessman (and noted saloon pugilist) who was known far and wide for his substantial physical bulk. He was a founding member of the city’s “fat men’s club” and was reported to be the heaviest man in the city. When he died suddenly at the age of 45 (probably not a huge surprise, as his obituary mentioned that his weight had, at one time, reached 438 pounds), his new hotel had been open only weeks (perhaps only days). His unexpected death threw the running of the hotel into confusion. His brother (another famed “fighting fat man”) took over the business side of its operations and occasionally placed ads in the paper seeking a hard-to-find buyer. Eventually the hotel was sold, and it went through several owners and name changes over the years. 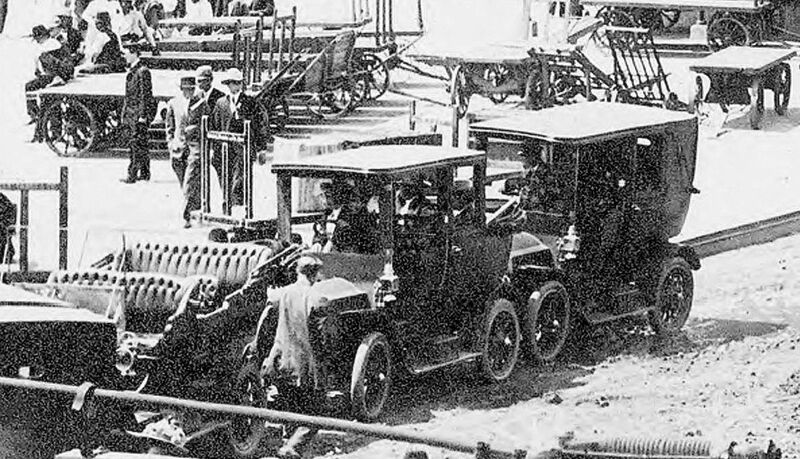 Then, in 1916, a major catastrophe struck: brand new Union Station, which was waaaay on the other side of town, opened, consolidating passenger rail service to one depot, resulting in the shuttering of most of the city’s smaller depots. Location, location, location wasn’t such a great thing for the old Skelton hotel after this. 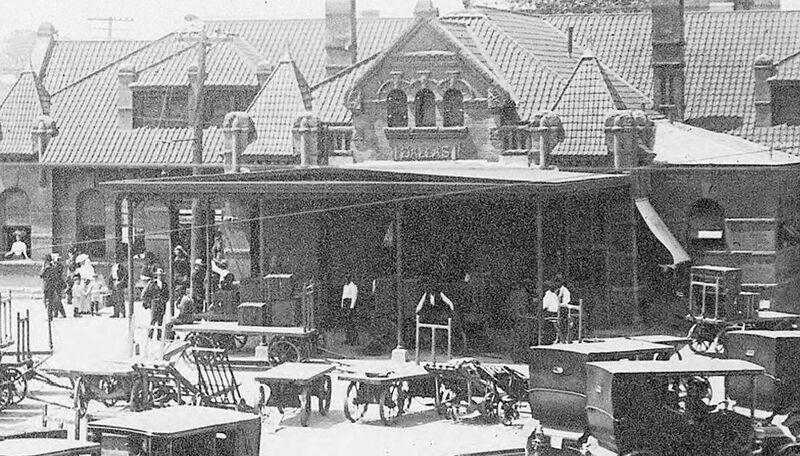 The hotel went through many changes over the years, but after the closing (and later razing) of the old Union Depot, it was on a general, inevitable, slide downward. By the time it was demolished in 1968 — when large swaths along Central Avenue were leveled to facilitate highway construction — the building was in disrepair and, apparently, long-vacant. It stood for 70 years. Below is a photo taken from Elm Street in 1908 or 1909, when the hotel (seen at the top left) was owned by Charles S. Conerty and named the Conerty Hotel (you can see the name on two signs, but you have to really zoom in to make them out). Conerty, an Irishman who had previously run bars, owned the hotel very briefly. By May of 1909, plagued with legal troubles stemming from his being charged with selling liquor on a Sunday, Conerty sold the hotel (which he seems to have been running as a boarding house), stating in his classified ad that he was “leaving city.” (He did not leave the city.) 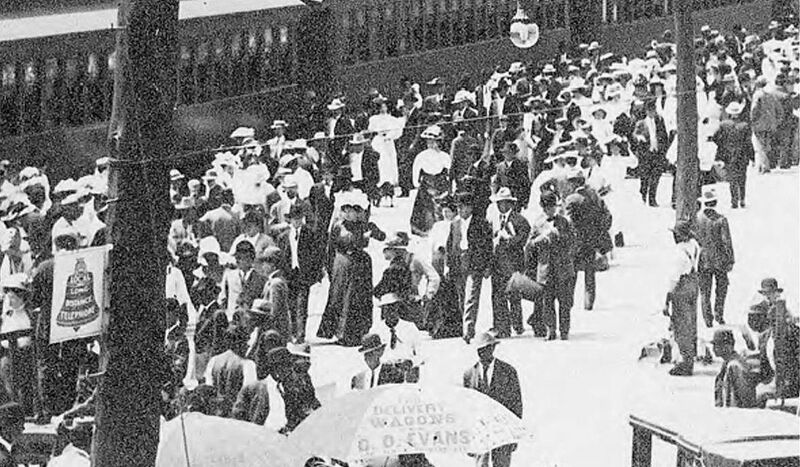 In 1910, with a new owner, the hotel was once again known as the Union Depot Hotel. Just seven or eight years after this photo was taken, all that human traffic was gone. And today? You’d never EVER suspect that that patch of empty land at the edge of Deep Ellum was ever occupied by one of the city’s busiest train depots. So where was it? 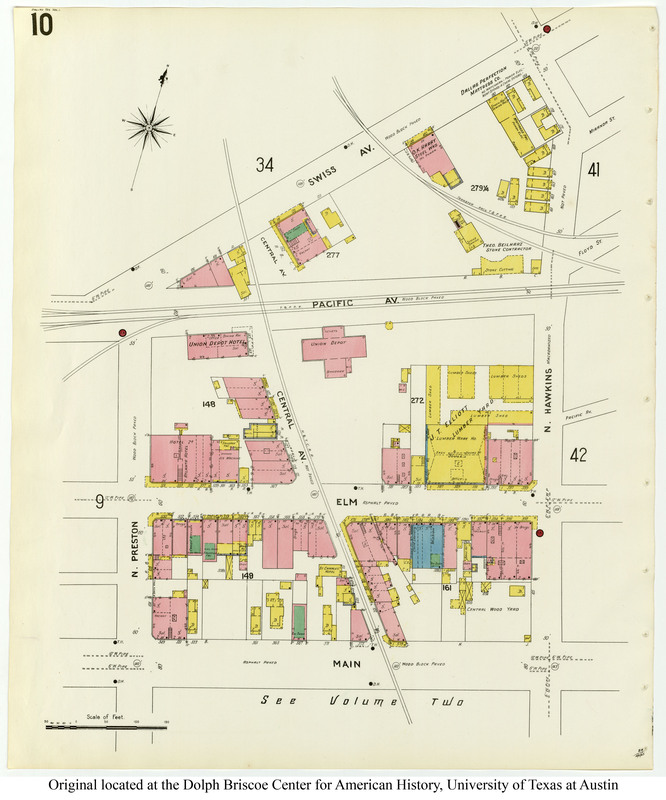 Get a good visual idea of how things were laid out in the Sanborn map from 1905, here. 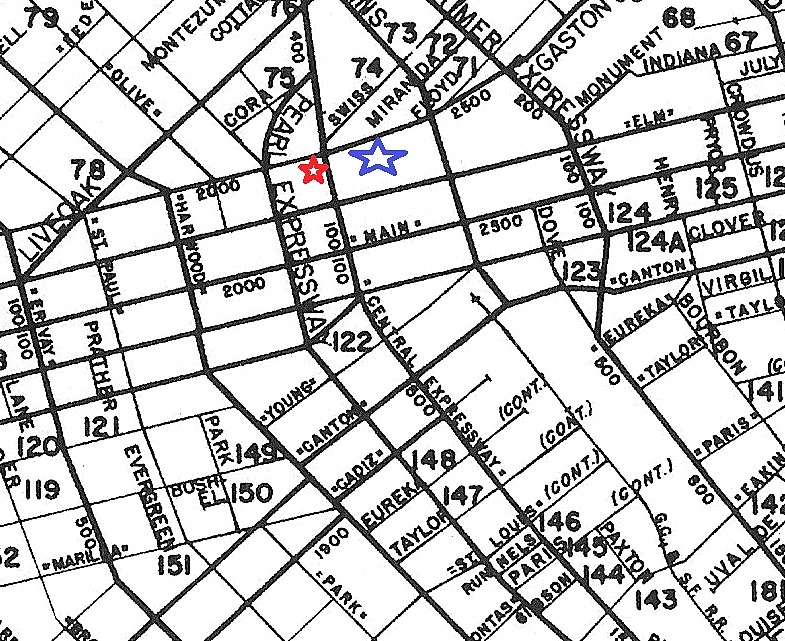 Below is a street map that shows where the hotel was (red star) and where the train depot was (blue star). These days? Depressing. See it here (the view is looking north from Elm — the hotel would have been under the overpass, the train station straight ahead). It’s interesting to note that during the heyday of the Union Depot, the west side of the block of Central Ave. which ran between Elm and Pacific was the only block in this area not filled with black-owned businesses or residences. 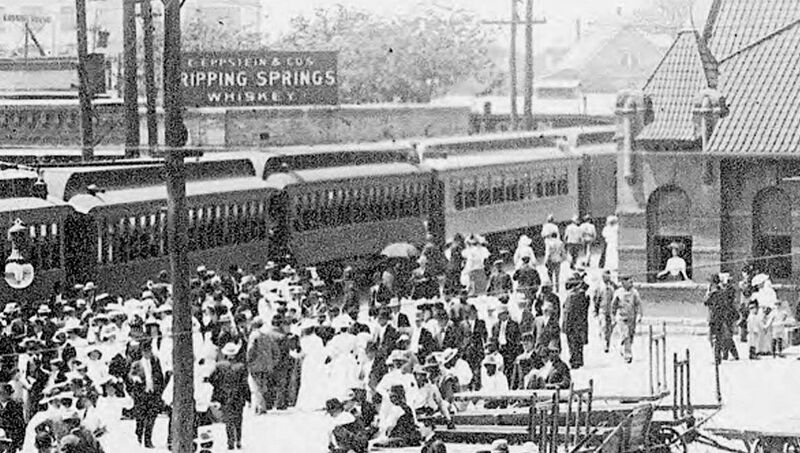 When the depot shut down and white-owned businesses moved out, the block began to fill with popular African-American establishments. It’s also interesting (to me, anyway!) to realize that the Gypsy Tea Room of the 1930s was just a few steps to the left of the hotel in the top photo. It took me forever to try to figure out where the Gypsy Tea Room had been — I wrote about it here. Top photo is a detail of a larger photo, from the Squire Haskins Photography, Inc. Collection, University of Texas at Arlington Libraries; it is accessible here. The same photograph is shown in full farther down the post — this copy is from the DeGolyer Library, Central University Libraries, Southern Methodist University, and it is accessible here. The quality of both photos makes it difficult to zoom in on them with much clarity, but both sites offer very large images to view. As mentioned above, an entertaining Dallas Morning News article full of historical info about the area around the depot is highly recommended: “Demolition Leveling Once-Noisy Deep Elm” by Doug Domeier (DMN, Oct. 19, 1968). (I’m not sure why the hotel is referred to as the “Grand Central Station Hotel” throughout — just substitute “Union Depot Hotel” whenever you come across that incorrect name.) The article also has a few paragraphs about the Harlem Theater which was also about to be torn down as part of what Domeier described as the “brutal change” then affecting Deep Ellum. See a great early-’20s photo of the hotel building (the Tip-Top Tailors moved in around 1922) in the book Deep Ellum: The Other Side of Dallas by Alan Govenar and Jay Brakefield, here (the view is from Pacific to the southwest). 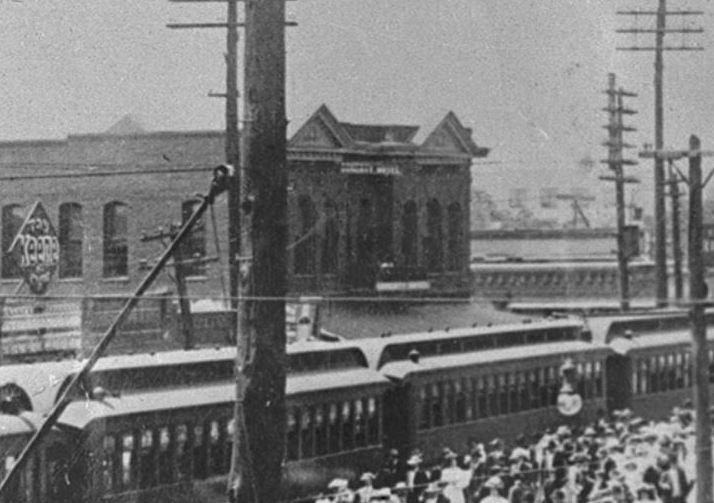 A related Flashback Dallas post — “The Old Union Depot in East Dallas: 1897-1935” — can be read here. Another great post. The Union Depot photo is one of my favorites and it is cool to see more info on what is in it. I am a descendant of the Skelton’s and had heard some of these stories. I would love to have more information and share what I have been told through the years. could you email me? Isn’t there supposed to be a locomotive buried somewhere in that vicinity? Seems like I saw someone comment about that in some online Dallas history group a few years ago. They would be pretty crazy if true!